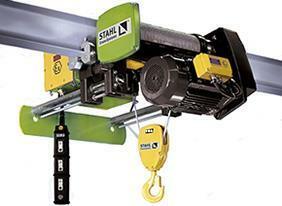 The explosion-protected SH Ex wire rope hoist is a leader in lifting and crane technology all over the world. Precision engineered, these hoists are built for reliable operation, high efficiency, and long service life. The SH Ex is available in explosion-protected designs in compliance with NEC, ATEX, and IECEx regulations. Hoists can be configured to your unique application needs. Available in 5 frame sizes with 26 load capacity variants. Compact dimensions due to U-shape design. Exceptionally short approach allows for optimum use of work area. Features such as coated hooks, brass wheels, and brass drop lugs on trolley are available. Extremely smooth starting and braking characteristics. Largely maintenance-free design with field-proven components designed for low wear and long service life. Available as deck mount, monorail trolley, and double girder trolley models. Trolleys are equipped with two travel speeds as standard with additional speeds available as options.